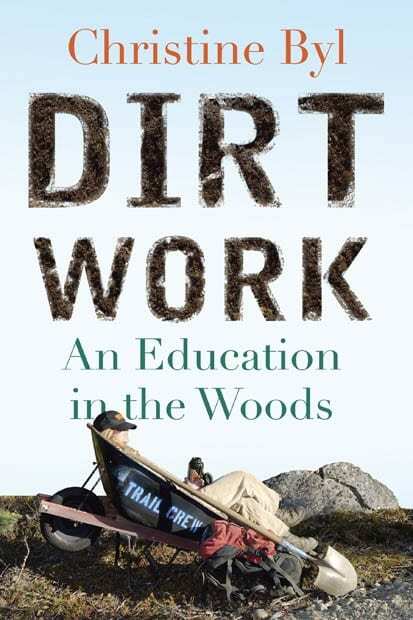 This is a guest post by Christine Byl, author of the just published book – Dirt Work: An Education in the Woods. I live just outside Denali National Park, in Alaska, and of all the many things I can say about such an incredible and complicated place, this is one: it’s wolf country. I have had many wolf sightings since I moved to the area 8 years ago, including, most dramatically, a wolf pair splitting a caribou herd to pick off a calf and a wolf father feeding pups from a carcass with its mouth, both off the famed Denali Park Road. Even in my own humbler backyard tundra, I see wolf prints on the trail behind our place every month of the year, imprinted in mud, post-holed in snow. Despite all this lupine Alaskan drama though, my first wolf sighting, in Western Montana, remains the most potent in my wilderness psyche. Glacier National Park. October. I was maybe 24, a few years in to my trail crew career, falling head over heels with wildness in any form. Driving south down the road after dinner at the Northern Lights Saloon in Polebridge, my partner and I were headed back home to West Glacier, fall’s stiff dark enveloping the truck. We’d had a few beers, a big dinner, and I leaned my head back against the seat in the drowse between wake and sleep, listening to soft pedal-steel on the radio, washboard ruts vibrating my thighs. The truck lurched as Gabe tapped his foot on the brake and stuck his arm out in front of me, an instinctive gesture. “Look,” he whispered, “wolf.” I opened my eyes. Gabe turned the wheel slightly, casting headlights toward the shoulder. Twenty feet ahead, it stood just off the road in profile, as still as if zapped in midstride. If you’ve ever seen a coyote and wondered, Could that be a wolf, it wasn’t. I’ve seen a coyote and wondered the exact same thing. Seeing a wolf, I did not wonder. Even if I hadn’t known anything about how large wolves are, how long their snouts, their legs, I think I would have known. The world seemed to close in around the edges of my perception until it was only me and the wolf, our eyes locked, some ancient knowledge passing—stop. Did I think this? Please. That wolf cared nothing for ancient knowledge, and in any case, I had little of it to give. To the wolf, I was neither augur nor soul mate, only an obstacle in the terrain, an odd creature that inched close. Its eyes were distinct, its gaze forward. We sat that way for a minute, probably less. The wolf walked, slow, out of the beam of our lights and along the length of the passenger side of the truck, five, eight feet away. Gabe switched off the lights. My window was rolled down a third. It was too dark to see well but I could hear it outside the window. The night’s noise went on around us, I’m sure, the squeak of a far-off rusted fence gate, a wind chime clattering in the eaves of an abandoned barn, but I remember those moments as if the world were muted, as if the wolf and I were the only things passing before a set stage. No Gabe. No truck. When it reached the tailgate, the wolf cut across the road and trotted down into the ditch line and up again, vanished into the woods between the river and us. Gabe and I sat in the truck in the dark. No talk. No touch. For a minute, just dark. Of all the animals I’ve seen over the years, the brief glimpses and long stares, I remember that wolf more clearly than many. Every Alaska wolf I see is still refracted by this first interaction, and the impressions I recall. Not so much the motions of it, not where the wolf walked and how long it took and what I thought when it disappeared. But its eyes reflecting light, how the shoulder muscles undulated beneath the thick beginnings of its winter coat. I remember that it didn’t run. It never seemed wary, or curious. Not canny, smart, devious, or fierce. We crossed its path and it regarded us briefly before making its way toward pups in a den, a deer kill buried in a hole, or miles more hungry walking under the slim moon. That night, whether because of culture or nature, my wishful tilt toward wildness or an evolutionary hunch, I felt the borders of physicality and transcendence shift until one allowed the other in, and when the wolf slipped into the woods, I wanted to follow it. I wanted to dip my face to the river to drink, tear flesh with my teeth, flatten myself a bed of needles with a circling pace before sleeping. Never mind the blood on my face. Never mind the cold. Have you seen a wolf in the wild? If so where – and how did it make you feel? Wow, what incredibly beautiful reporting! I’ve never seen a wolf but I remember just as clearly as you’ve described here the first time I saw a lion. I could relate to the way you and Gabe sat silent, watching the wolf. It reminded me of how my friends and I watched the lion speechless, motionless. Even after he left, the only thing we way we communicated was through whispers, as if we were in church. @Marcia Very well put! I think if is a privilege to see many animals in the wild – and we stay silent so we won’t be attacked or eaten – but also because I think that’s how we show awe and wonder. Your lion story is beautiful. @Nikki Thanks for coming by. I have never seen one in the wild, but I’m visiting a place in France with wolves in semi-captivity. I’m not sure what that means yet, but I’m excited to find out! @Christy They probably have huge enclosures in a natural setting for the wolves – which is still exciting – but it’s the real wild where you feel their power. I’ve never been lucky enough to see a wolf in the wild but did get to hear them in Isle Royale National Park. It was a highlight of our trip! @Tricia I’ve thought of visiting Algonquin Provincial Park in Ontari in the fall just to heat the wolves howl. I imagine it to be a spine tingling experience. @Andrew I saw my first wild wolf in Manitoba this past winter – just as the sun was starting to set. It was truly an unforgettable experience and I can relate to Christine when she tells about the wolf looking her in the eye. I felt his gaze too. I’ve never seen a wolf other than in captivity. They are incredible to see, even caged – it is still possible to gain a sense of their majesty and quiet, raw power. I would love to see and hear them in the wild. @Sheryl I have seen wolves at the bottom of Grouse Mountain in Vancouver but there’s nothing like seeing one in the wild. I had canoed the Thelon River (in the NWT) years ago where there were lots of wolf dens but not a single wolf did we see in 10 days. What evocative reading this is! Beautifully written. I haven’t seen a wolf but was very interested to learn recently about the wolf / coyote hybrids that are becoming relatively common, especially in cities. Chicago is reputed to have about 200 in it’s city limits, even living right downtown where they said they can only be tracked but never actually seen, even by the naturalists that are studying them. @Heather I had no idea that there were wolf/coyote hybrids – and why they’d choose a big city is beyond me. I’ll have to look online for more info but a huge thank you for your input. I guess I am one of the lucky ones. Having grown up in northern Quebec and that now some time ago, I can’t actually recall my first wolf. One of the more memorable times was as a geologist working in the North West Territories where we saw wolves regularly. The wolves followed the caribou migration and “mopped up” the laggards. Really sad but nature’s work. A truly memorable day was the one when I was alone on traverse and was followed by a net of 5 wolves who maintained about a 200 foot distance. My approach was shown no fear or weakness. If I walked towards one of them he would simply fade back and the net would close in behind. A bit unnerving at times but I kept up an energetic pace and after a few hours met up with some of my gang and the wolves lost interest. Thanks Christine for rekindling the wolf memories. @John I’ve always been envious of your experience – as it’s so out there and they really had the upper hand and yet you were never threatened. Truly a one of a kind experience. I saw this book yesterday at the Barnes & Nobles in West Seattle and I was really drawn to it. After reading this story about the wolf, I will certainly be reading it. Christine is a fabulous storyteller! @Krista I envy Christine’s ability to tell a story – but that’s what you get after years of writing practice. I have been lucky enough to see two wolves and they were both from the car. The first one I was lost in Moorhead, Minnesota, which is just over the border from Fargo. I got lost on a country road and an enormous husky ran across the road right in front of me. I thought it strange why a dog would bolt across the road. I finally found a house and knocked on the door for directions. I asked if they ever saw wolves around here, and the lady said quite often. I realized it was my first wolf. Although I only got a quick glimpse. Second sighting was driving down the north shore of Lake Superior just south of Grand Maraas early in the morning. In the middle of the road was a giant dog. This time I realized right away it was a wolf. I stopped and it lopped into woods and turned to look at me. It was amazing. I know what you mean about not mistaking wolves for coyotes. There is no comparison between the two. Not only does a wolf tower over a coyote, they just have a different aura of wildness about them, which is described beautifully in this article. @Ted A few years ago we came across a “wolf” on the road but in hindsight it was just a large coyote. You absolutely know it when you see a wolf – maybe they’re hardwired into our genes but it was instant recognition too on my part. Good for you as a guy asking for directions – something my husband hates to ever do! Beautifully written narrative! It would be amazing to see a wolf in the wild but have not been lucky yet. I love how you described that encounter with the wolf. What a special memory! We hope to visit the California Wolf Center soon though. It’s as close as we can get to wolves for now. @Mary Seeing a wolf in the wild is a phenomenal experience. I think when you look eye to eye with a wild animal it does something to you inside. And the one I saw was incredibly healthy & beautiful.I wish it had stayed around a little longer. We are making our way up north as I type. Wonderful article and I am so excited to get this book and go on the look for some wolves! My kids are going to love this! Thanks! @Justin I sure hope you run int some wild wolves. Consider yourself blessed if you do. @northierthanthou Just seeing a wolf is always a thrill in my books. Lucky I love wolves and always wanted to see one. I have been studying wolves for so long I just cant stop. @Casie It’s always a thrill to see one in the wild.